I wrote a tutorial about Histograms long ago, and haven’t used any of that for my own histograms in years. I don’t use regular column charts, unless I need something really quick and dirty. Instead, I use XY charts for various reasons, and I follow the protocol in this post. A histogram is basically a column chart with value ranges (bins) laid out in numerical order along the horizontal axis, and the height of the columns encodes the number of observations within that value range. 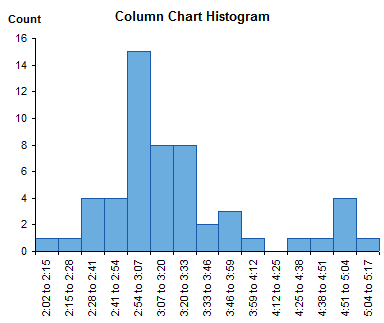 Data for a histogram typically looks like this, with the bin label in the first column and the count (frequency) within each bin in the second column. 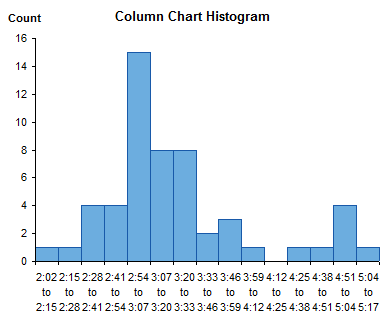 The typical Excel histogram is a column chart from this data. It shows the data well enough, although having more than a dozen bins squashes the labels together making them hard to read. Rotating the labels 90° unsquashes them, but they are equally hard to read unless you awkwardly swivel your neck. Another problem with a plain old column chart is that the bins look numerical, but the axis is categorical, and does not represent the numerical values of the bin boundaries. Unless you can do math in your head, and can force your mathematical brain to ignore what your visual brain sees, you don’t know that the bins are of equal width. In this case they are equal, but I’ve seen histograms which have unequal bin widths represented by equal width bars. This is just another way of distorting the data. To correct this problem, let’s modify the data, so we place the bin start values in the first column, and the count for the bin starting at each of these values in the second column. Now the fun begins. This is a similar exercise to that used to generate step charts, but we need not just a vertical line segment connecting adjacent horizontal steps, we need vertical line segments connecting these steps to the horizontal axis at the bottom of the chart. So we need to modify the simple table above. In the first block below I have stacked up three copies of the data. These are color coded so we can trace the data through the next steps. In the second block I have indicated two cells that need to be deleted, with cells shifting up to fill the gap. The third block shows the data after deleting these two cells. Finally I sorted the data by the first column, resulting in the striped last block below. The rest is easy. 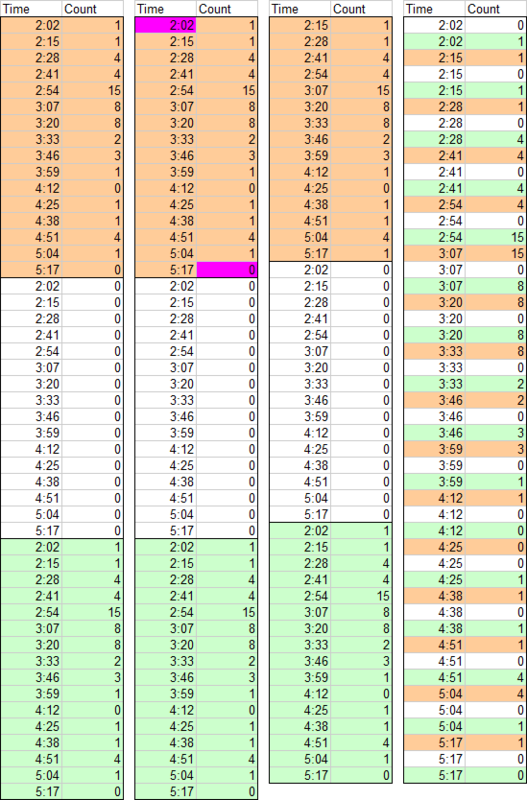 Make an XY chart, using the lines-without-markers option, from this last block of data, and format it to look nice. 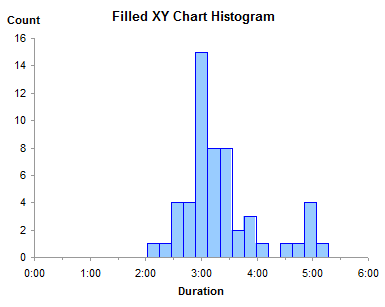 The lines connecting the XY points trace the sides and tops of each histogram bar. 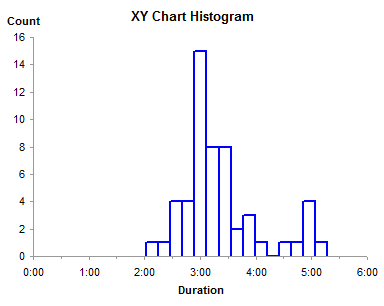 The advantage of this type of histogram is that the X axis is truly numerical. The axis can be formatted with the minimum, maximum, and spacing that you want. The min, max, and spacing can be natural “human-friendly” values, not values defined by statistical calculations to excessive significant figures. And you can see by inspection that the bins are of equal width. The disadvantage of the XY chart histogram is that the bars are only present in outline: they are not filled with your favorite colors. In the next article I will show a technique to fill these bars. If you want a head start, you can refer back to the tutorial that shows how to Fill Below an XY Chart Series with an XY-Area Combination Chart. Posted: Monday, February 14th, 2011 under Chart Types. 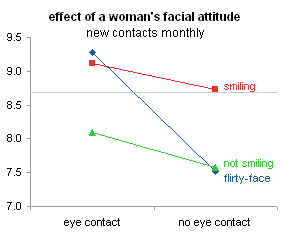 In Dating Site Photo Effectiveness I proposed dot plots to show how different topics of profile pictures lead to different success rates of attracting attention from potential dates. The original analysis in The 4 Big Myths of Profile Pictures used bar charts which were potentially confusing because the origin of the bars was not zero, but instead was the average of all the data. Since my earlier post, Nathan wrote Get a Date With Your Online Profile Pic – Myths Debunked in his Flowing Data blog, and I was inspired to write about some simple graphical statistical tools. 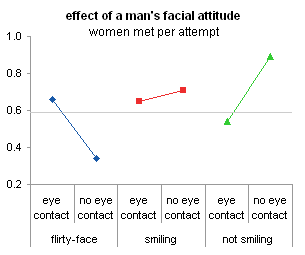 The original analysis showed also the effects of facial expressions and eye contact on photo effectiveness. 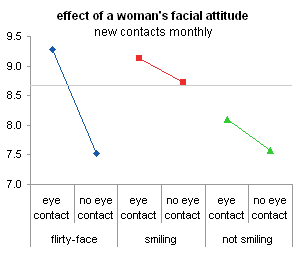 Profile pictures of women making eye contact are more effective than those without eye contact, for all of the facial expressions. 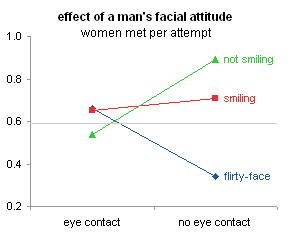 Flirty-face pictures with eye contact are the most effective, while flirty-face pictures without eye contact are least effective. Bar charts show the data reasonably well. When the bars overlap, they may lead to conclusion, because the front bars partially obscure the back bars, and the back bars may appear smaller than they actually are because of this obstruction. It’s also not as easy to see the relative effects. When performing a statistical analysis, one of the simplest graphical tools at our disposal is a Main Effects Plot. This plot shows the average outcome for each value of each variable, combining the effects of the other variables as iff all variables were independent. 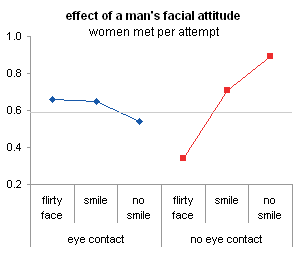 In the chart below, we see that the averages for smiling (with and without eye contact) is highest, the average for not smiling is lowest, and flirty-face lies in between. 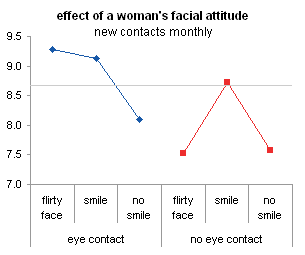 The average for eye contact is greater than for no eye contact (for all facial expressions combined). We could have estimated these effects from the bar chart above, but it’s helpful to take the time to plot these effects. The data is shown below, with ranges shaded to match the color of the plotted points. The two columns to the left of the data are used to produce the two-level category axes in the charts. There is no need to label the series, since the series identification is simplified by these dual axis labels. Note: I’ve used simple averages from the data in the original article’s charts, but in a real analysis you would have to weight the averages by the proportion of individuals using each level of each factor. The main effects plot is simple and does not provide a great deal of information. Showing just the main effects of each factor level without accounting for the levels of other factors is simplistic and misleading. 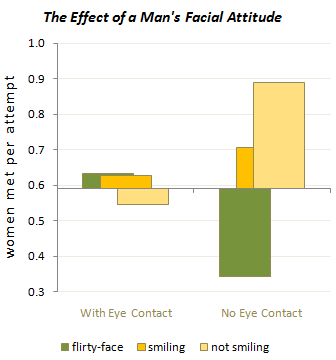 For example, we might assume that the best success would come from smiling and making eye contact, and the worst from not smiling and not making eye contact. 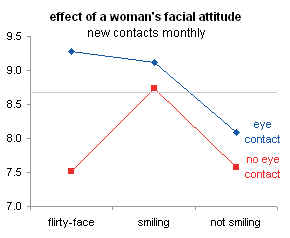 In fact, the flirty-face picture accounts for the best success (with eye contact) and the worst (without eye contact). Another graphic statistical tools at our disposal is called an Interaction Plot. This type of chart illustrates the effects between variables which are not independent. Such a plot looks like the charts here. There are two versions, to illustrate better the effects of eye contact and of facial expression. In fact, the original bar chart above shows interactions between factors, but it is more effective to use markers with connecting lines to display the data. 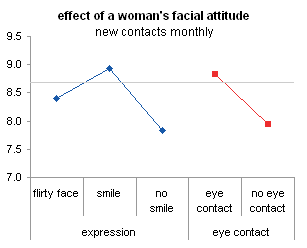 The two charts show the effect of expression for the two eye contact categories (left) and the effect of eye contact for the three expressions (right). The charts can be made easily using data with the appropriate arrangement. 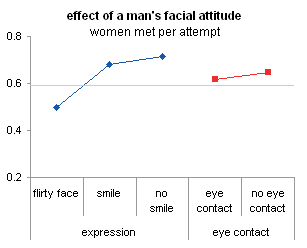 The chart on the right shows that the flirty-face expression is most effective, with eye contact. Without eye contact, this expression is a loser. The two charts need independent data ranges. The two columns to the left of the data are used to produce the two-level category axes in the charts. There is no need to label the series, since the series identification is simplified by these dual axis labels. An alternative and perhaps more common layout for interaction charts is shown below. As above, the two versions emphasize the effects of facial expression and of eye contact. The series use the same single tier of category labels, and the lower tier of labels has been replaced by data labels on the series themselves. This alternative has the possibility of becoming more cluttered, but it also shows interaction effects more clearly. 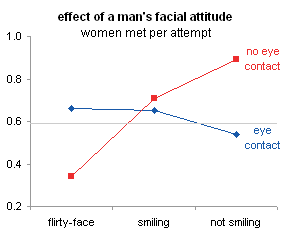 For example, the nearly parallel smiling and not smiling lines in the right chart above indicate only a very weak interaction between eye contact and smiling, but the much steeper flirty-face line shows a stronger effect (or an interaction) of eye contact when the facial expression is a flirty face. 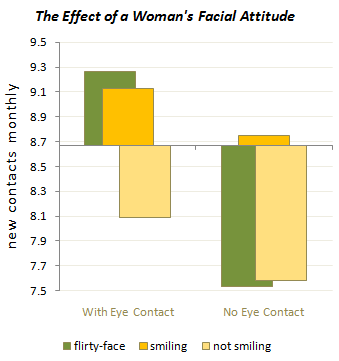 The nearly parallel segments in the left hand chart show the same weak interaction between smiling and eye contact, while the huge difference between the two flirty-face data points show a strong interaction. These two charts can use the same data range, using either columns or rows for the series data. Using series names as data labels adjacent to data points effectively identify the data. The same approach above provides insights into the photo effectivemess for male subjects. Here is the original bar chart. Posted: Wednesday, February 17th, 2010 under Statistics. Tags: Interactions, Main Effects, Statistics. I talked about LOESS smoothing in LOESS Smoothing in Excel, where I showed my improved VBA function for calculating smoothed data. 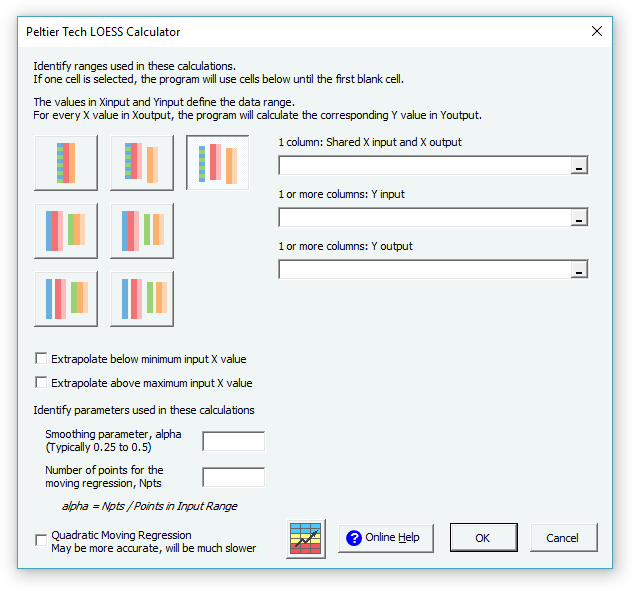 I introduced an improved LOESS Smoothing utility in LOESS Utility for Excel. Since I use the utility frequently, I encountered many things about it that I wanted to change. Since I am the developer of the utility, I have actually been able to make these changes. And after a few months of use and a few hour-long sessions aimed at making it do what I want it to do, I’ve developed this utility into something that is, in the local vernacular, “wicked awesome”. If you’ve never seen “Good Will Hunting”, that means “way cool”. What makes this utility so great, you ask? The calculations were already perfectly adequate, and I didn’t change them at all. But I’ll show the new dialog, so you can see what has changed. First, the previous interface for selecting input and output ranges was frustratingly restrictive. So I made the range selection function much more flexible. The colorful buttons on the left indicate the built-in options. In the most elementary case, all four entries (X input, Y input, X output, and Y output) are separate ranges, which can even be located on separate worksheets. The options make range selection easier if some columns happen to be adjacent to each other, or if the same X values are to be used for both input and output. The range selection (Ref Edit) boxes and related labels update according to which option has been selected. 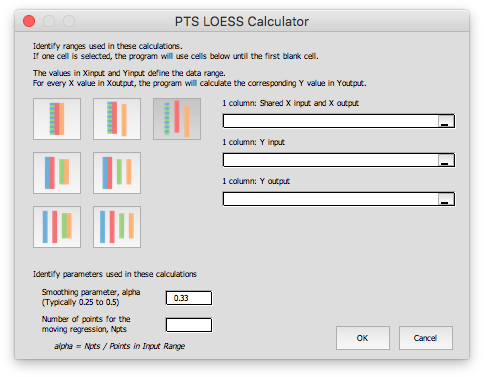 When the X input range has been selected, the program determines Npts, the number of points that should be used for the selected value of alpha. When the user changes alpha or Npts, the other parameter updates. In the following case, one column serves as X input and X output (A7:A135), the adjacent column holds the Y input data (B7:B135), and the program will dump the Y output into a separate column (D7:D135). Even this wasn’t smooth enough for me, because I got tired of scrolling up and down to select long ranges. So I made another improvement. I made the program smart enough to know that if only one row had been selected, it should use the range of data below the selected row, stopping at the first empty cell. 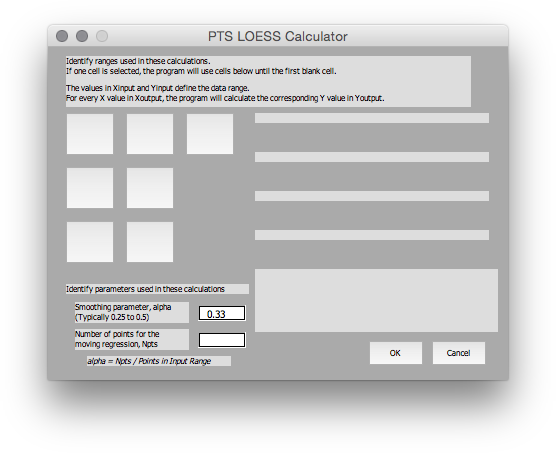 The last change I made was to have the utility store the last LOESS parameters in each worksheet. This way, if I run a particular analysis on each sheet in a workbook, I only have to activate that sheet, run the program, and the dialog is pre-populated with the settings I need. What a time-saver! Here is a demo of the new utility. This analysis only took a few minutes. I started with some Global Temperature Anomaly data from NASA. I ran the utility to generate a smoothed temperature anomaly curve. Then ran the utility a few more times to see the effect of alpha (number of points in the moving linear regression) on the shape of the smoothed curve. The values of 42, 25, and 12 points correspond to alpha values of 0.33, 0.2, and 0.1. The fewer points (i.e., smaller alpha) in an analysis, the more that the smoothed curve follows local variations in the data. 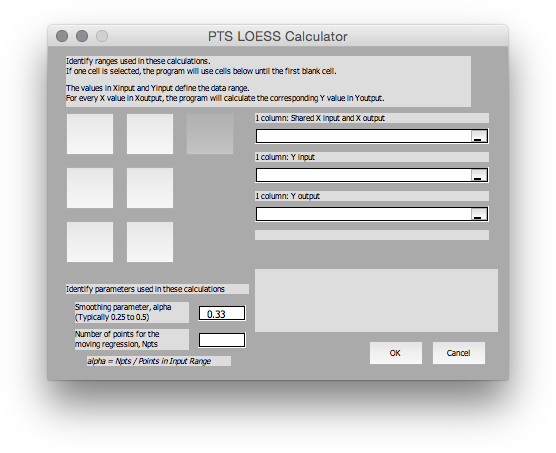 Click this PTS LOESS Smoothing Utility link to download the utility. The download is a simple Excel add-in. Save it to any convenient directory, then install it following the instructions in Installing an Excel Add-In or Installing an Add-In in Excel 2007. I’ve written a companion article, LOESS Utility – What the Buttons Mean, that shows how to use the different buttons in the dialog for the various input data layouts that you may have. This utility was written in 2009 for Excel 2003 for Windows. It has a button that appears on the Excel 2003 menu, and later versions of Excel for Windows place duplicate buttons on the Add-Ins tab of the ribbon. 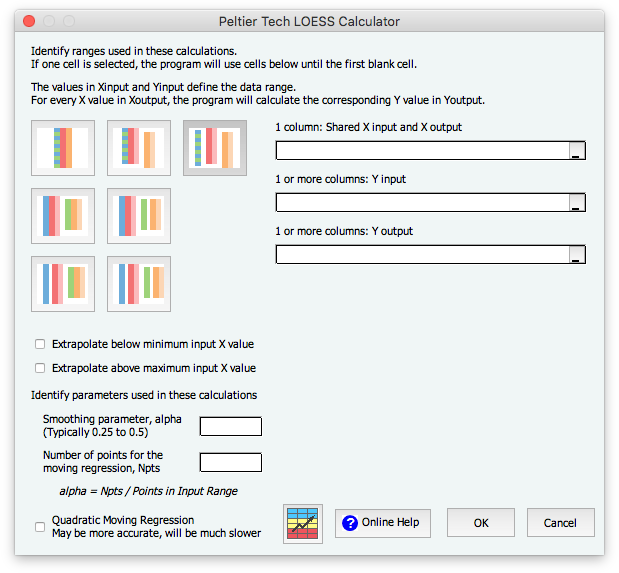 The utility was not updated for Excel 2007 and later for Windows, and no steps were taken to make it as nice in Mac Excel. During installation, Mac Excel 2011 ignores the code that produces these buttons, while Mac Excel 2016 displays two error messages saying Run-time error 5: Invalid procedure call or argument. Despite this, the add-in can still be used in Excel for Mac. In Mac Excel 2011, go to the Tools menu > Add-Ins, click the Select… button, navigate to the PTS_LOESS.xla file, then click OK to return to Excel. In Mac Excel 2016, go to the Tools menu > Add-Ins or click the Excel Add-Ins button on the Developer tab of the ribbon, click the Browse… button, navigate to the PTS_LOESS.xla file, then click OK to return to Excel. Because the interface elements do not appear in either version of Mac Excel, you need to run the VBA procedure by name. In Mac 2011, go to the Tools menu > Macro > Macros…, enter LoessDialog as the name of the macro, and click Run. In Mac 2016, go to the Tools menu > Macro > Macros… or click the Macros button on the Developer tab of the ribbon, enter LoessDialog as the name of the macro, and click Run. Since Windows uses points as its main unit of measure while Mac uses pixels, the dialogs are shrunken by 25% on the Mac (a pixel is only 75% as large as a point). The dialog color on the Mac is a very drab gray, and the buttons and other controls are unattractive. When the dialog first appears in Mac Excel 2011, it looks like this. The icons are missing from the buttons (another Windows-Mac-Excel-VBA incompatibility), and the various textboxes which match the dialog background in Windows are much lighter on the Mac. You will need to refer to my article LOESS Utility – What the Buttons Mean to see which button is which. You can tell which button has been clicked (button 3 below) and you can easily tell which data entry boxes are available. The dialog color isn’t as drab in Mac Excel 2016, the textboxes match in color, and the button icons are all visible. Despite these deficiencies in its dialog, the add-in works perfectly well in Mac Excel 2011 and 2016. Follow guidelines here and in LOESS Utility – What the Buttons Mean. 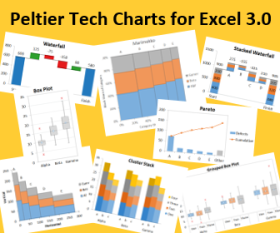 I liked this utility and used it so much, that I’ve included an enhanced version in my commercial Excel Charting software, Peltier Tech Charts for Excel 3.0. Here’s the dialog in Excel for Windows (Excel 2007 to 2016 shown in Windows 10). 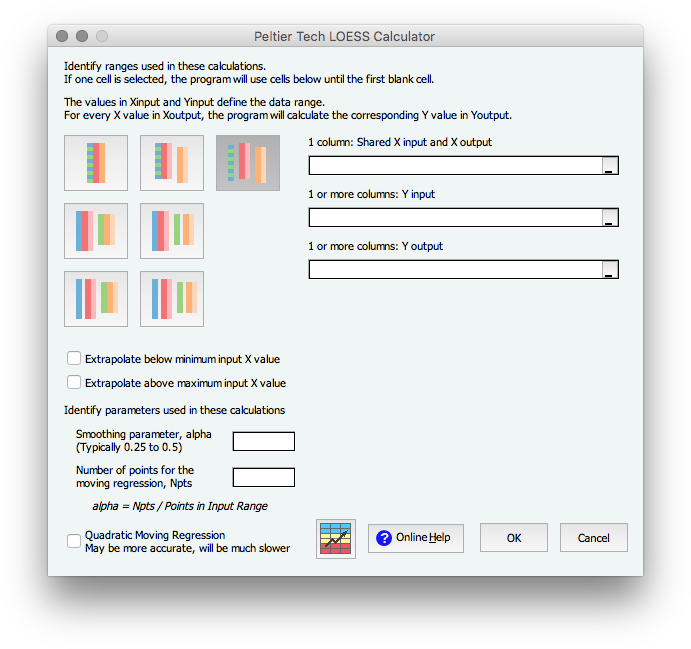 Here’s the dialog in Excel 2011 for Mac. And Here’s the dialog in Excel 2016 for Mac. The dialogs look substantially the same and work exactly the same in all of these versions. Posted: Thursday, October 8th, 2009 under Utilities.